Monk: After we left 12 Bones in Arden, Speedy and I headed to Switzerland Cafe and General Store in Little Switzerland. 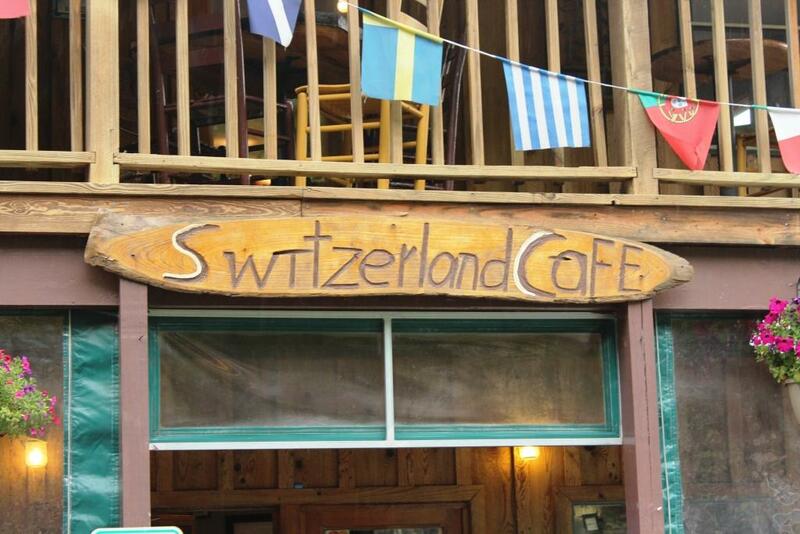 Side note: who else knew that there was a Little Switzerland in North Carolina? Show of hands? No one else? ANYWAYS, in case you were wondering it is located just off the intersection of Highway 226A and the Blue Ridge Parkway, near Marion. 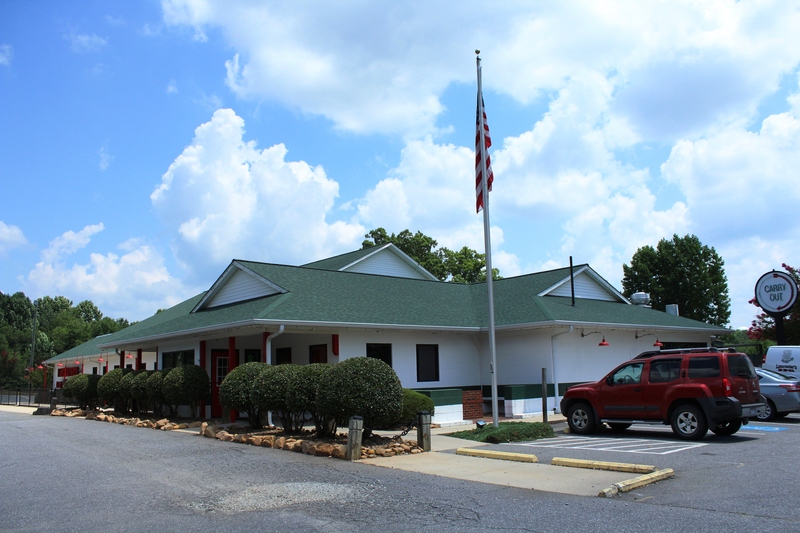 Switzerland Cafe was the most recent addition to the NC Historical Barbecue Trail, essentially replacing Deano’s in Mocksville. And next to Herb’s in Murphy, I’m willing to bet its the most remotely located. Speedy: We went on a rainy/foggy afternoon, so we really couldn’t see that well where we were driving. To say it’s off the beaten path is an understatement. Now this could be a good thing, as a joint has to attract business to stay open, and the more remote it is, the harder it is to attract business. 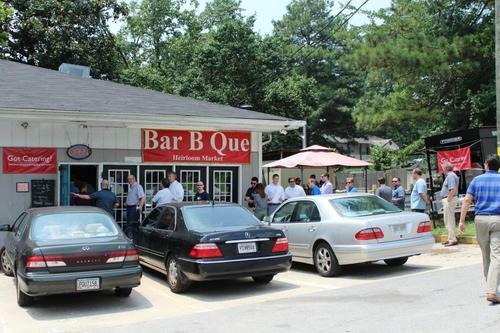 However, whenever a barbecue joint’s main attraction is something other than the ‘cue, I’m skeptical. 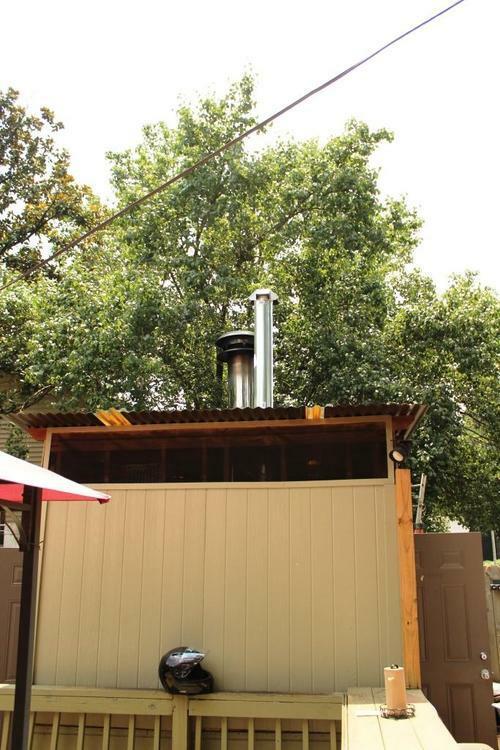 Monk: Before ordering, we checked out the smoker located in a colorfully decorated shack out back. We stumbled upon a couple of workers checking on some pork butts in the smoker and got to check it out a little bit. Switzerland Cafe uses a vertical smoker with little more than a pan separating the hickory wood coals from the stack of pork butts. This was definitely a unique technique I haven’t seen in other pits on our barbecue travels. Speedy: And honestly, I’m not sure it’s a technique I’d recommend. It does keep the direct heat off of the meat, but seems like it would keep some smoke away as well. However, it was a super cool smoker and awesome opportunity to check it out. 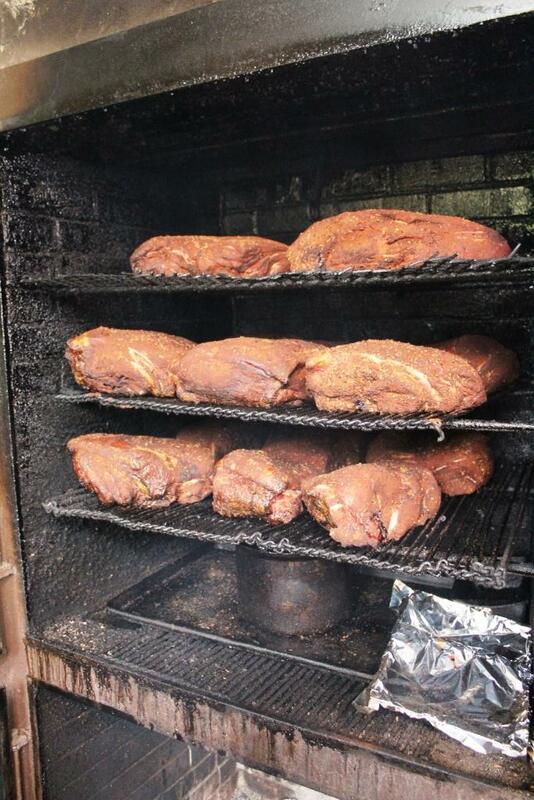 But we weren’t there to look at the smoker – it was time to eat. 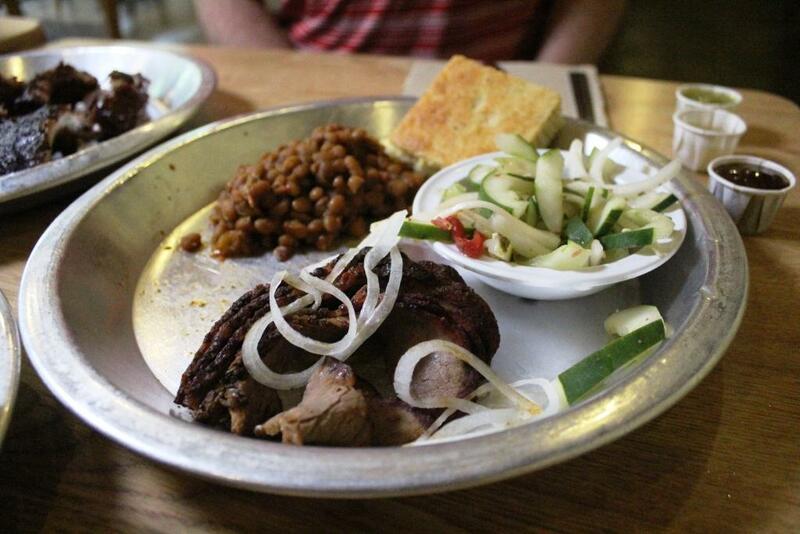 As we had already had a massive barbecue meal at 12 Bones, I decided to stick to the essential – the “barbeque cafe platter,” complete with slaw and baked beans. Digging in, something about the pork was a little off to me. It was plenty tender, but the taste was just not exactly what I expected. It wasn’t bad, but it lacked the expected pork flavor. My best guess is that the odd taste is due to being cooked in the same smoker as the fish. 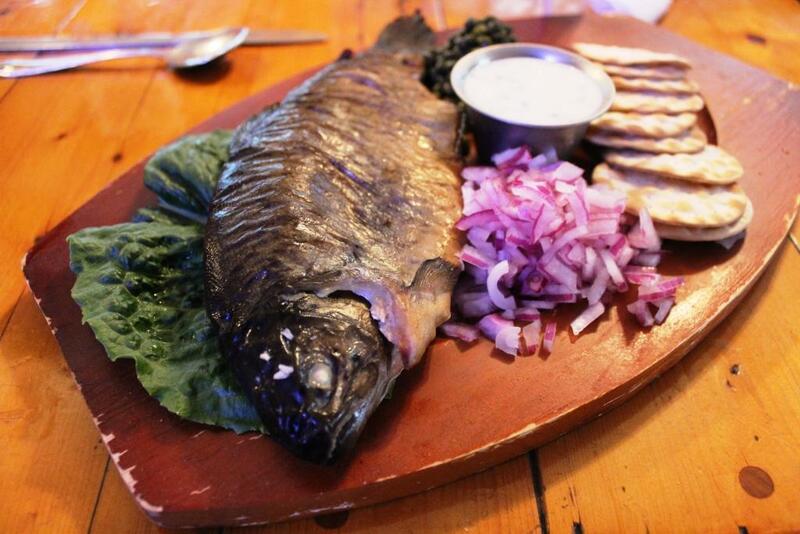 Monk: Speaking of the fish, I tried “The Whole Trout” appetizer as my dish since it was so unique (not to mention I also was stuffed from 12 Bones). I apparently didn’t read the menu too carefully because as I took a forkful of the trout I was surprised by the fact that it was chilled. 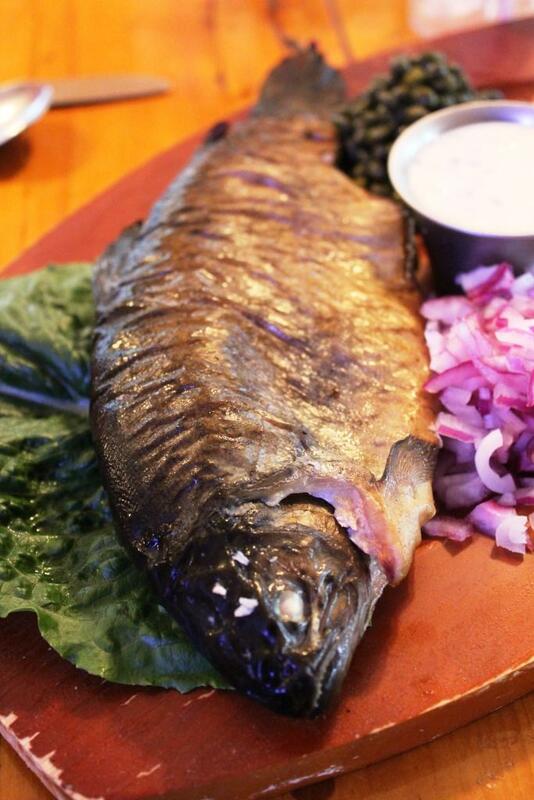 I could taste the smoke – unlike the pork cooked over hickory, the fish is cooked over applewood (h/t) – but it was just unexpected and different. I think its worth trying once, but if I ever find myself back I probably won’t order it again. One of the owners also brought us out a smoked salmon BLT because she wanted us to try, and I took a sliver. Had I been hungrier, I would have eaten the whole thing because that thing was pretty delicious. They also offer a smoked trout BLT, but we didn’t taste that. 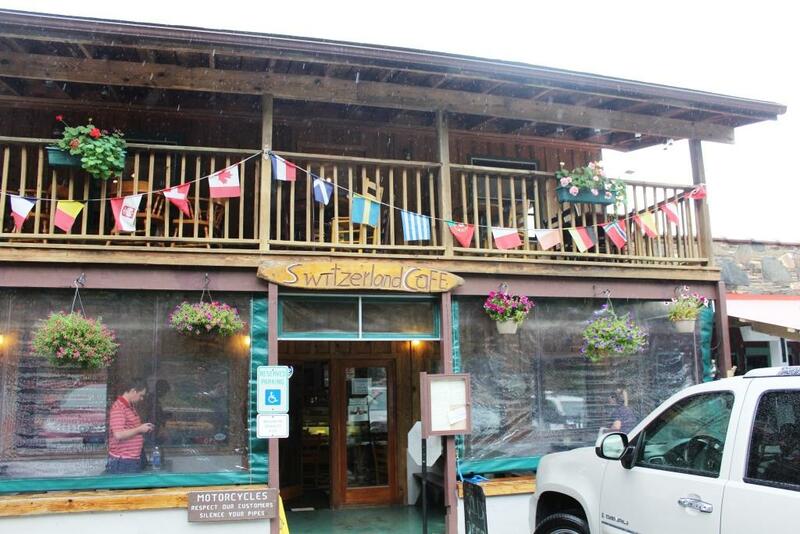 Speedy: Overall, Switzerland Cafe was a fine barbecue meal, but likely the last I’ll ever eat there. I think Monk liked it better than I did, but the location is just so remote that it would take an amazing meal to compensate. Unfortunately, it just wasn’t there for me. 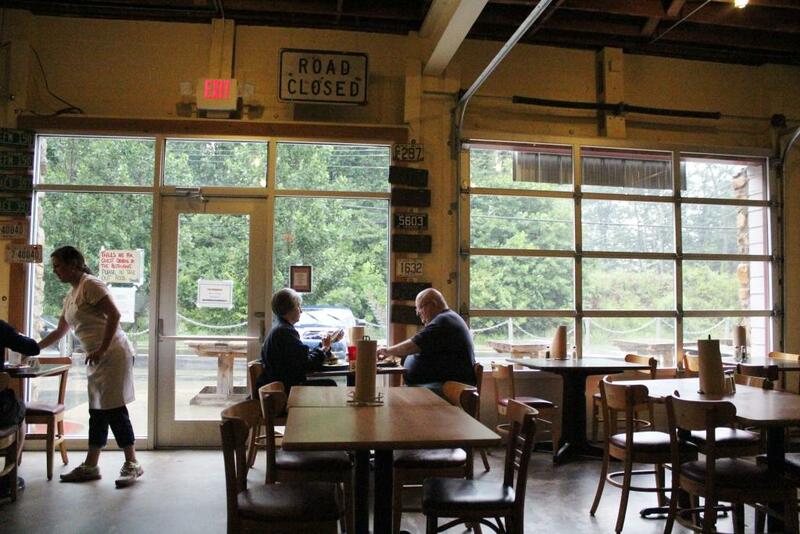 Monk: One joint that’s been on our hit list ever since we started the blog 2+ years ago was 12 Bones Smokehouse in Asheville. 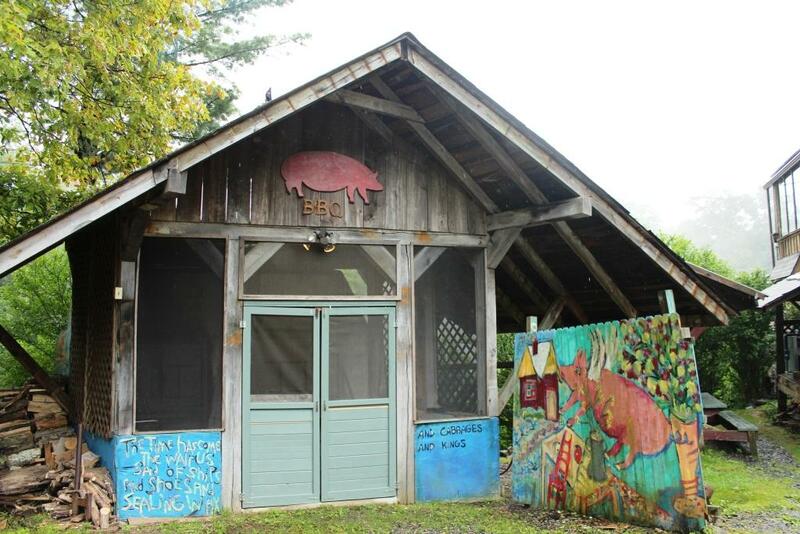 All of our past visits came pre-blog, with the River Arts location outside of downtown Asheville being nearest and dearest to our heart. They actually do have two locations – one in River Arts and another in nearby Arden, out towards the airport – and on this day we found ourselves in Arden (more on that in the future). Speedy: This was my first visit to the Arden location, and other than the location, I think I liked it better than the River Arts locale. It’s bigger and has similar outdoor seating. The old gas station atmosphere has a really nice feel to it, so I enjoyed it very much. As for the order, Monk and I went a little crazy. 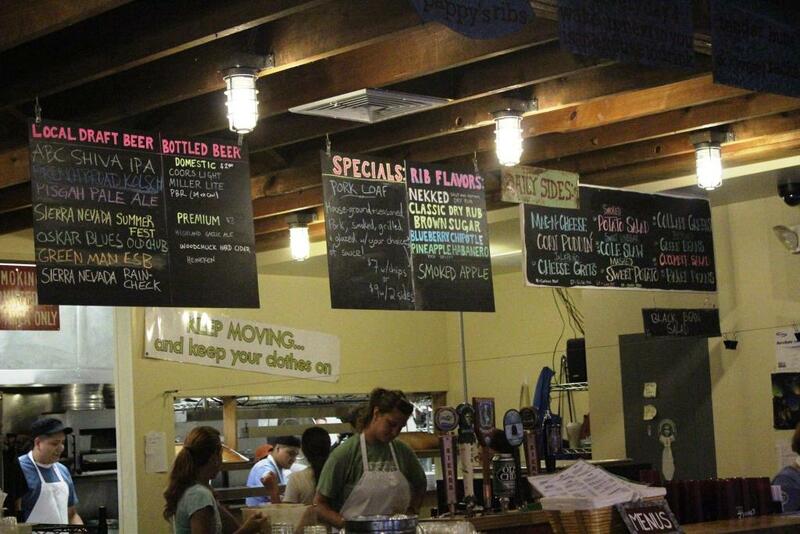 We ended up ordering three bones of each type of rib offered, a brisket plate, a pork plate, sides, and beers. It was definitely a lot of food, but we were hungry, so the order wasn’t out of line. Monk: For once I didn’t sabotage myself and eat anything before a barbecue meal! 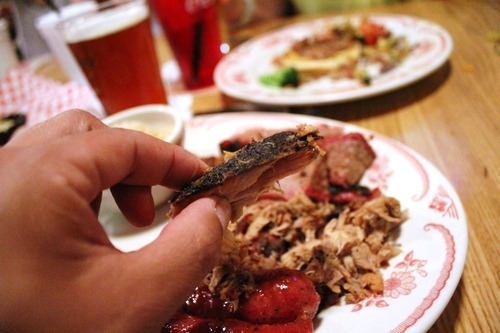 As for the food, the pork just didn’t have the smokiness in the bark that I prefer, which is likely due to being smoked in a Southern Pride gasser. It’s pretty clear that the pork is not the focus of 12 Bones, which shouldn’t be all that surprising considering the name. 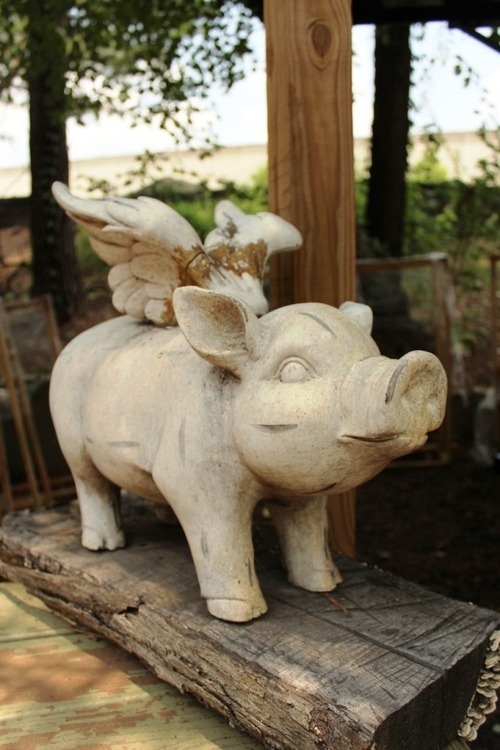 Speedy: All things considered, I thought the pork was pretty decent. While it won’t win any awards on this blog, it had good tenderness, and I thought there was a touch of wood flavor (though not enough). It’s clear by the wood piles of oak and hickory in the back that 12 Bones does make a concerted effort to impart smoke flavor into their gas cooks, so for a gas cooker, I think this is some of the better pork I’ve had. Monk: The brisket was pretty unfortunate, really. It was very thinly sliced (think sliced deli roast beef on setting 2 or 3) and thus had dried out considerably by the time we got the food. Plus, similar to the pork it didn’t have the smoke or smoke ring in the bark. 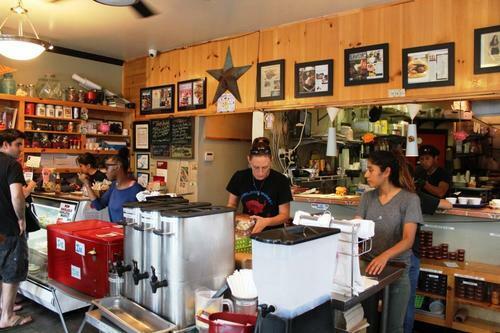 I had not gotten the brisket here before and based on this visit, customers should avoid it as well. Speedy: But let’s be honest – you don’t go to a place called 12 Bones for the brisket. 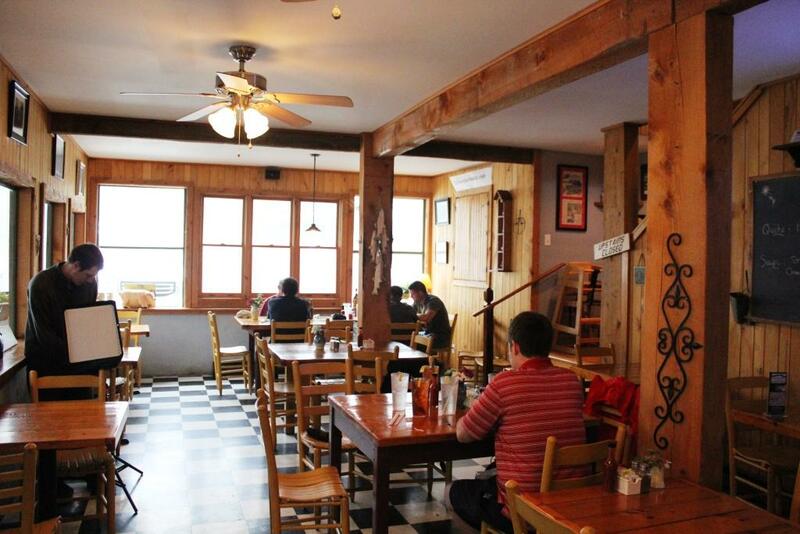 The ribs are as good as you’ll find anywhere. 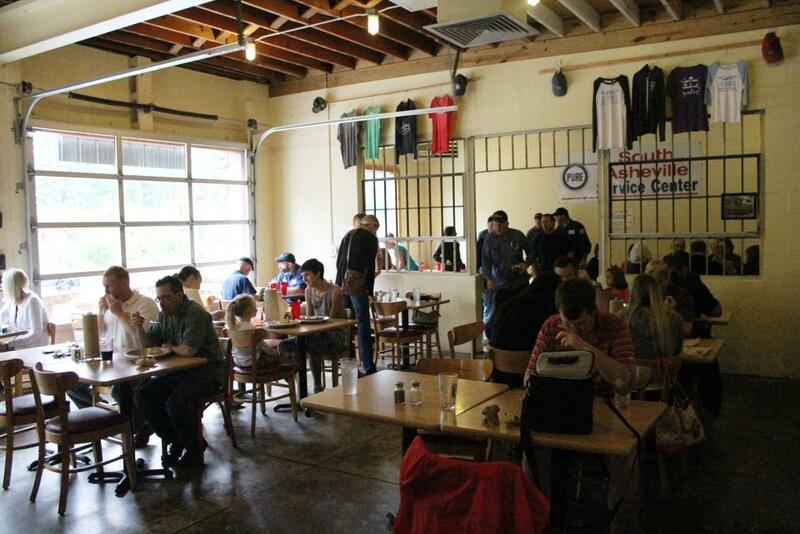 12 Bones is known for its unique and eclectic sauces, and on this day, they had their standard salt/pepper rub, brown sugar, and chipotle blueberry ribs, along with special smoked apple and pineapple habanero ribs. Monk and I decided to order 3 bones of each flavor. 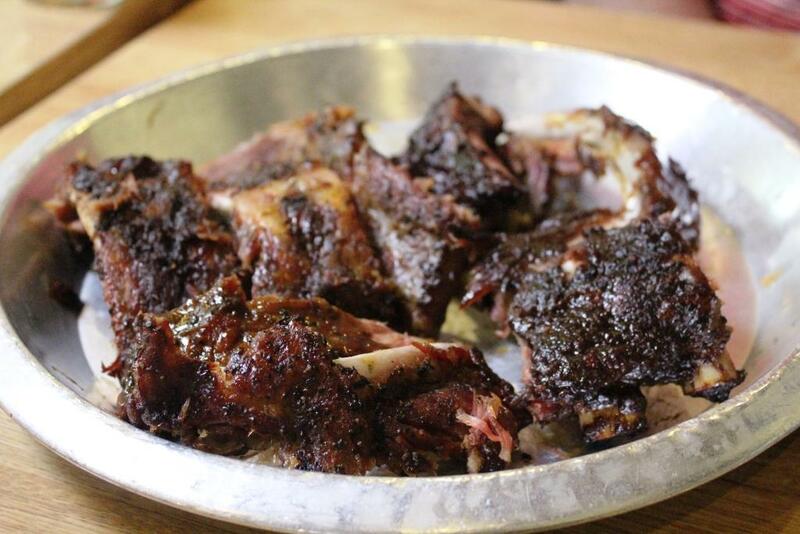 The ribs themselves are always cooked perfectly – tender without actually falling from the bone. The different sauces allow for different flavors, but I have noticed that 12 bones generally produces a very sweet rib, which is in contrast to the vinegar-y tang I’m used to when eating ‘cue. I think it ends up working very well and kudos to them for thinking outside the BBQ box. Monk: The ribs are definitely the highlight at 12 Bones, but holy heck watch out for those sauced with pineapple habanero. They start out sweet but can get you on the back end, particularly if you aren’t expecting it. And I definitely got got. 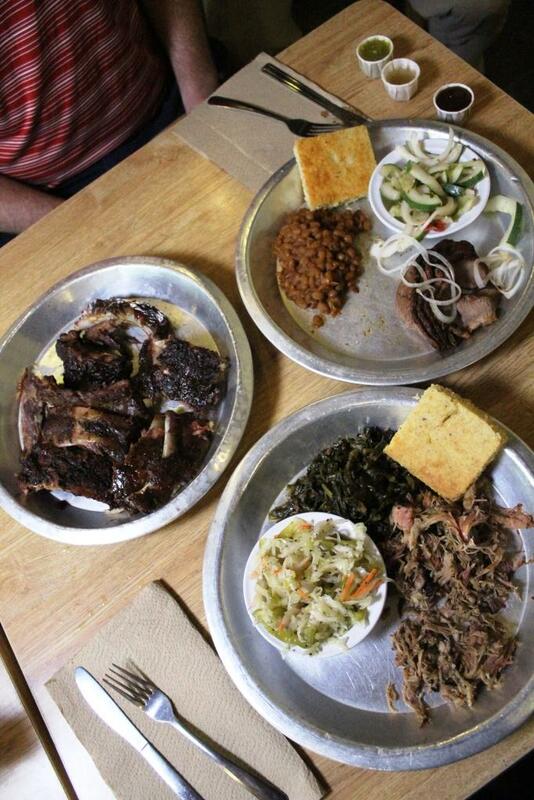 12 Bones has southern sides, but not all are necessarily what you think of when it comes to barbecue. A slice of cornbread comes with each plate, and I loved it. Had I not been stuffed by all of the meat, I would have eaten mine and possibly Speedy’s. 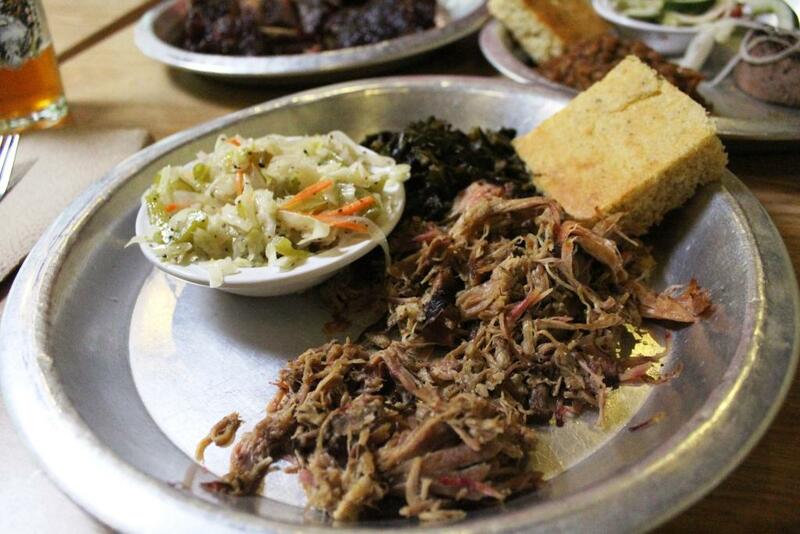 The collards, baked beans, vinegar slaw, and cucumber salad all had merit and I would recommend any of them as a side choice. 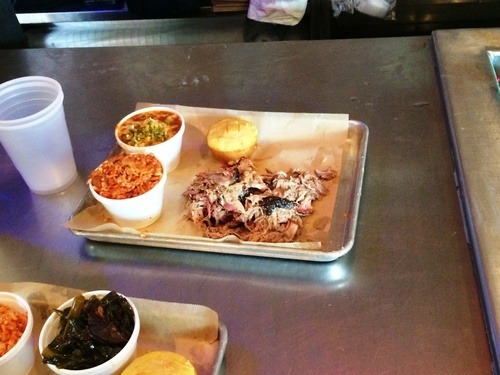 Again, not all were traditional barbecue sides but still worthy of an order. Speedy: You stay away from my cornbread, Monk! That stuff was delicious. 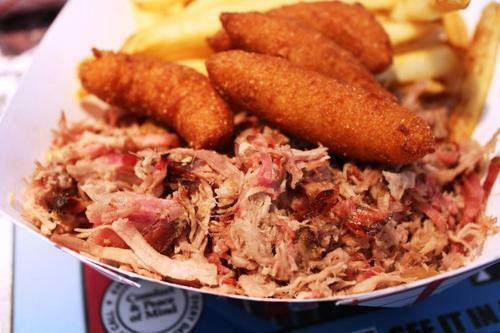 We’ve said it before, and we’ll say it again – you can’t get 5 hogs for sides if you don’t offer hush puppies, but 12 Bones gives you everything else you could want. 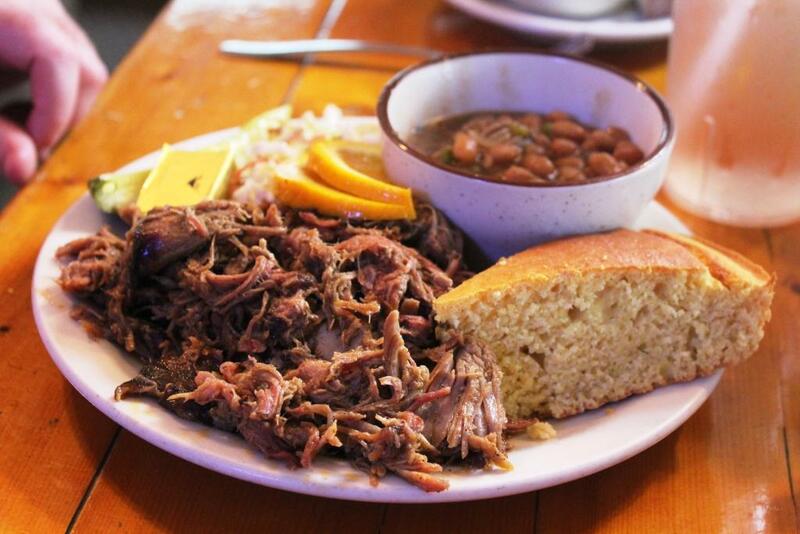 All in all, a meal at 12 Bones Smokehouse is a great experience. I had previously never ordered anything but ribs, and I don’t think I ever will again. I understand offering other meats, but really, if you order something other than ribs, it’s your own fault if you don’t enjoy the meal. So man up, order the ribs, and enjoy! 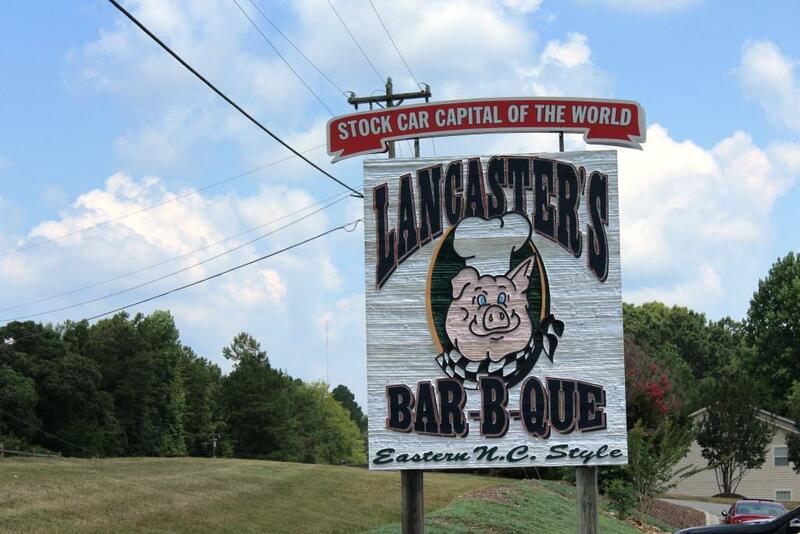 In my review of the Lancaster’s BBQ in Huntersville, I ended by saying I wouldn’t be rushing to the Mooresville location any time soon. Well as it turns out, less than 4 months later I just so happened to find myself there. But not because I necessarily sought it out. 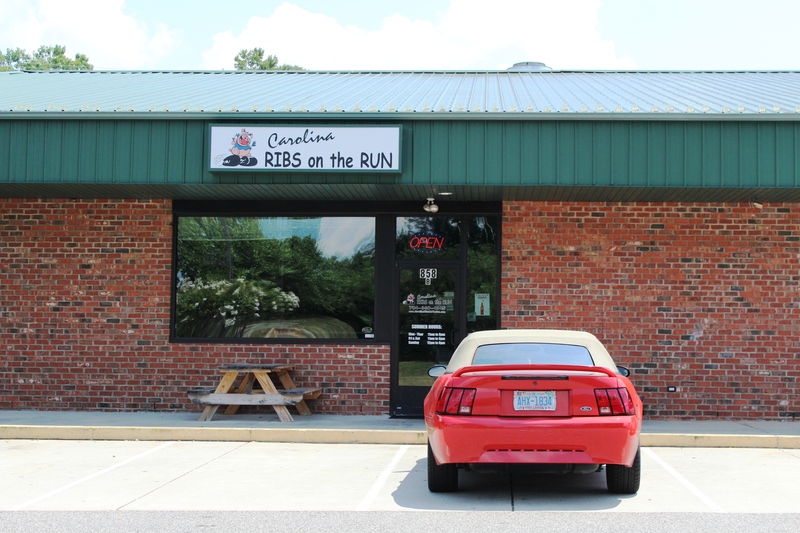 Right before I came here, I tried the sub par barbecue at Carolina Ribs on the Run after I dropped my wife off at a baby shower in town. 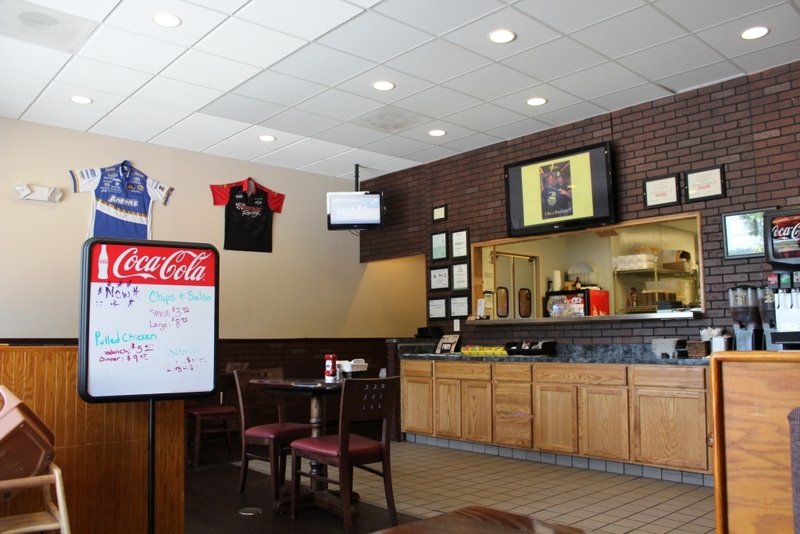 After I left, I still had a little more time to kill and was so disappointed with my previous meal that I decided to stop by Lancaster’s BBQ to try and salvage my lunch that day. But mainly because I knew they had beer and that sounded good at the moment. Seeing as how I had already tried the Huntersville location, I knew more or less what to expect. And Mooresville basically matched up to that, though I did rate the pork a little higher this time around. But I suspect that may be due to having it directly after the bland meal at Carolina Ribs on the Run (ok, I’ll stop piling on starting…now). At least this pork had some smoke and spice. It still wasn’t great. The slaw was the same mustard/mayo slaw as the other location. I was already pretty full so no hush puppies for me, which was too bad because they were the best part of my meal at the other location. In terms of decor, the Mooresville location takes the NASCAR theme and cranks it to 11 (after all, Mooresville is the “Official Stock Car Capital of the World”). 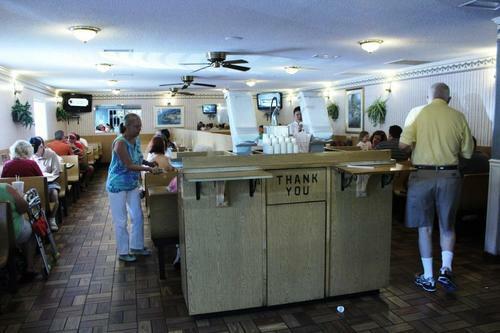 And they have a bus in the middle of the restaurant in which diners can sit in. So there’s that. 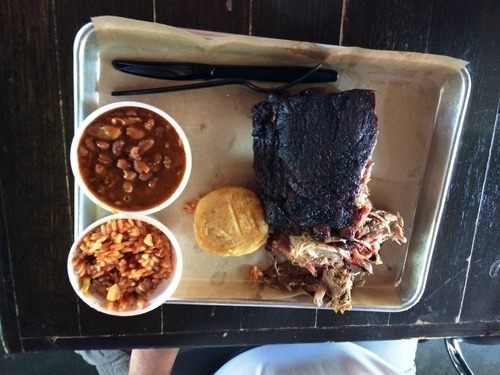 Unfortunately, the barbecue is still pretty average. 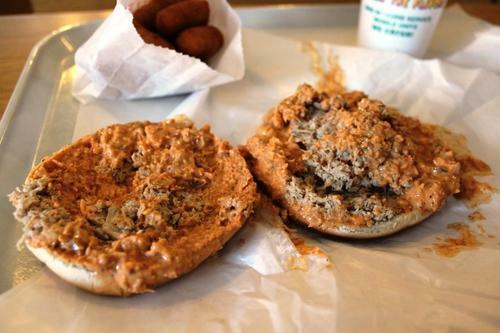 Usually, I am pretty good at researching and finding worthwhile joints to try when I’m in an unfamiliar area. 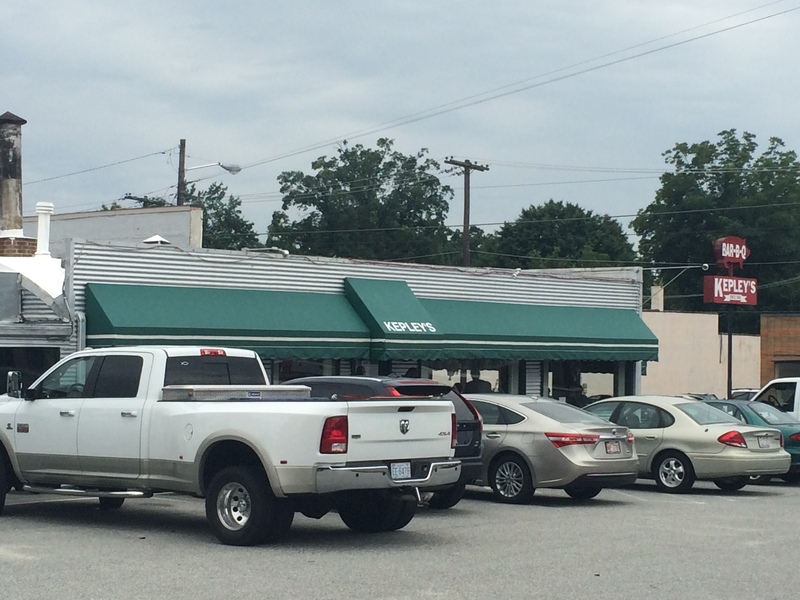 I thought I did the due diligence for Mooresville (in which I happened to find myself after dropping off Mrs. Monk for her cousin’s baby shower), but as I pulled up to an empty restaurant at 11:30 on a Saturday I immediately knew I had made a huge mistake. I even double checked to see if it opened at 12 on Saturdays but nope, it opened at 11. I contemplated going back in the car and going somewhere else, but I figured I was already there so I’d give it a shot. And yea…I should have just turned back around. Everything about the meal was below average. 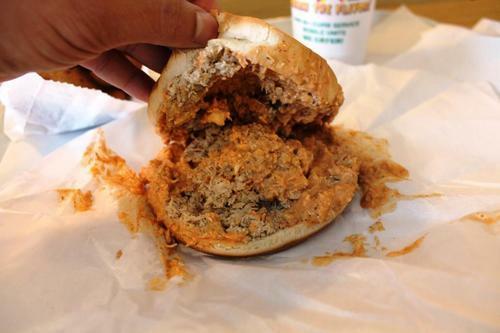 I bit into the pulled pork sandwich and…nothing. Blandness. The pork was moist but had no smoke, as if it was cooked in a crock pot (I wouldn’t be surprised if this was actually the case). The slaw on top of the sandwich tasted like a commercial mayo coleslaw. The hush puppies also tasted commercially bought and originally frozen. And to top it off, they asked what sauce I wanted for my sandwich so I ordered the “hickory BBQ” sauce on the side. Thankfully I did because you guessed it, it was a commercially made sauce. Perhaps I should have gone with the ribs, being that they are in the name and all, but I can’t see how they would have been too much better based on the pork. Plus, they use the same sauces. Speedy: I was recently in the home place of High Point during a work day, just working from my parent’s house. This seemed like as good a time as any to go back to my roots and grab some ‘cue from Kepley’s for lunch. 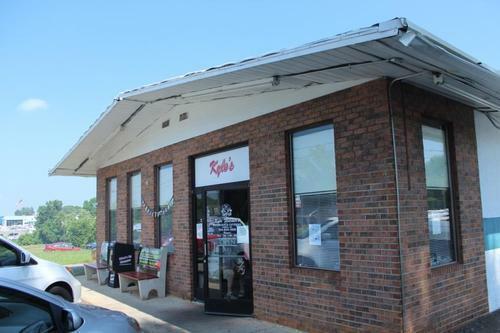 It has been a long time since I had eaten at Kepley’s, as I generally make the drive to Lexington in lieu of eating High Point ‘cue, but after this meal, I think I’ll opt for Kepley’s more often. Monk: You know, it’s sad to say that I’ve only eaten at Kepley’s once, and it was just 4 years ago. 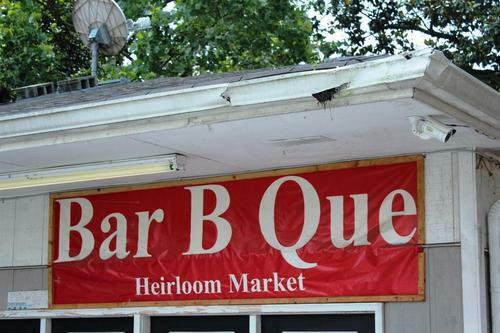 Sounds like I’ve been missing out on quality barbecue all these years. Rudy: I’m the same, it was a couple of miles away from my house and I rarely went, however I always enjoyed it when I did go. 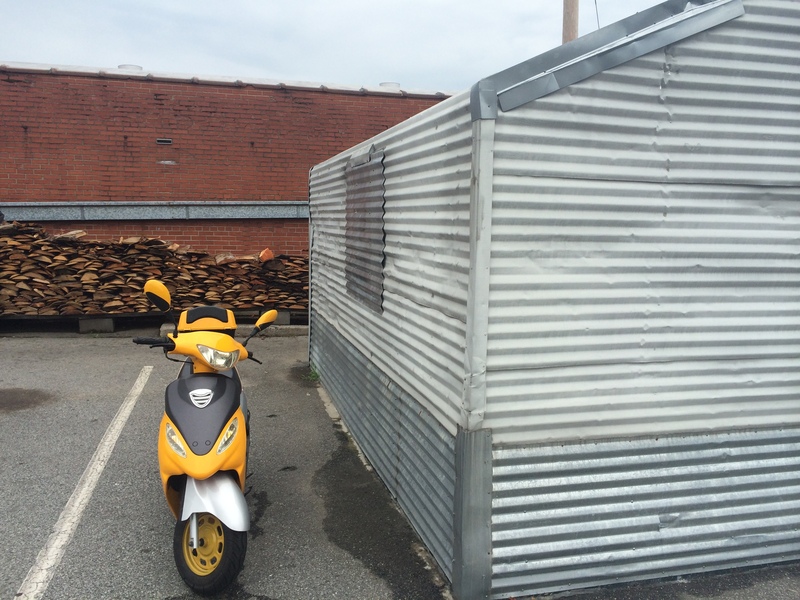 Speedy: The restaurant itself isn’t much more than a trailer – I’d be surprised if it could fit more than 30 people. 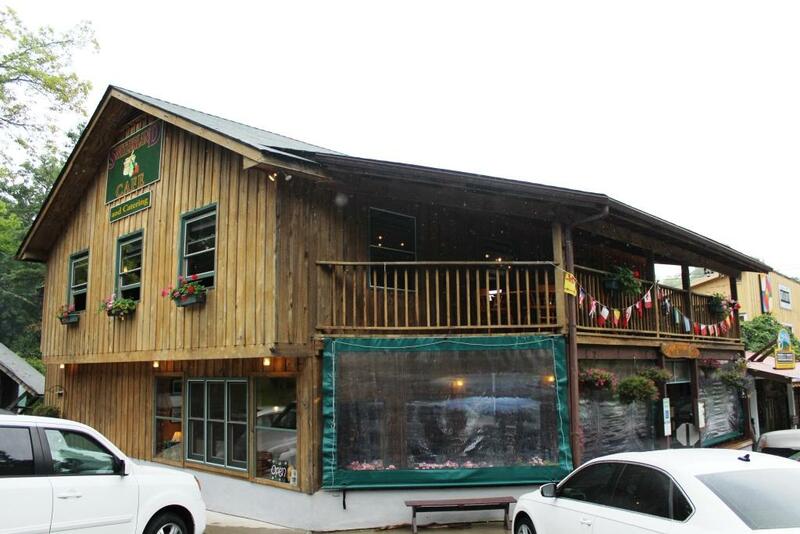 But it is quaint and is exactly what you think of when you think of a traditional ‘cue joint. 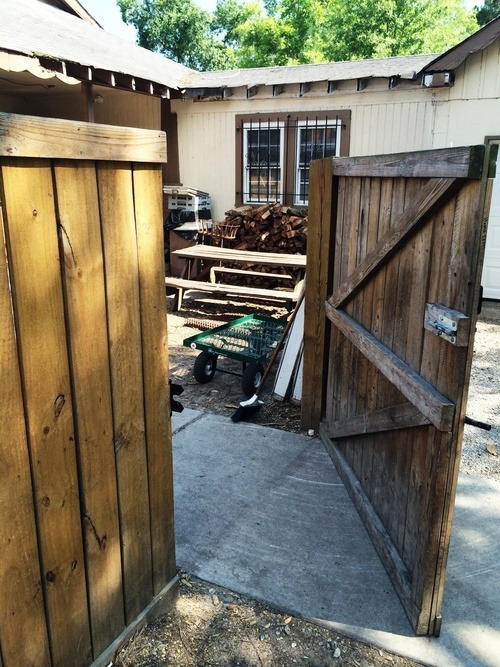 They do have a separate small smokehouse for smoking the pork shoulders and there was a large wood pile sitting outside the smokehouse – always a great sign. Monk: So I’ve been missing out on wood smoked barbecue in my backyard all these years! And not 2 miles from our high school. Man, I feel like an idiot. 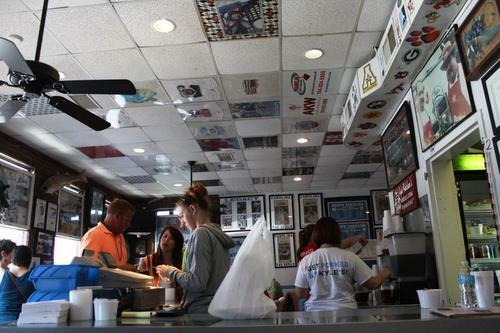 Speedy: One thing I love about these restaurants is the order process. 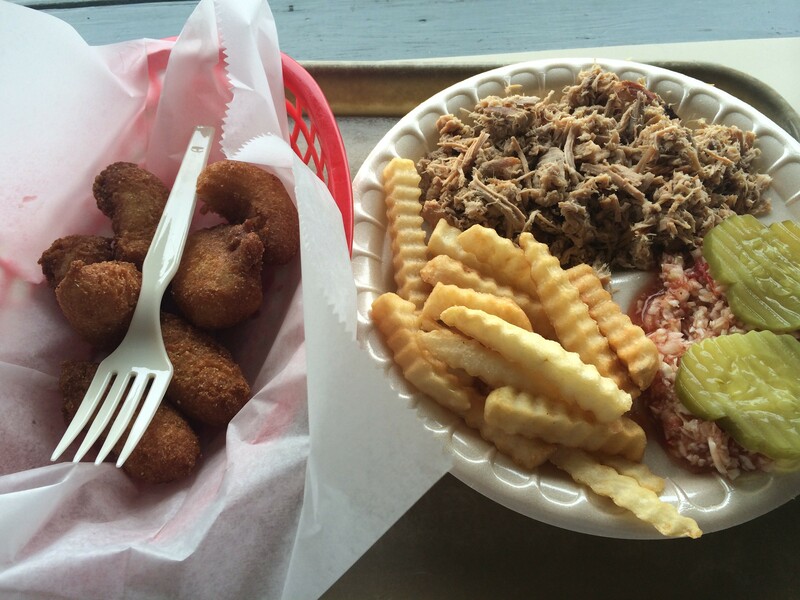 As the menu at most Lexington style joints is pretty consistent, all I have to say is “chopped tray with hush puppies and a Cheerwine” and I’m good to go. The food is then served quickly and you’re ready to eat. The pork at Kepley’s is really, really good. There’s just the right amount of smoke and bark. It’s clear these guys know what they’re doing. My serving was just a tad dry, but adding some extra dip provided on the table cleared that up immediately. The sides are also very good. The slaw could use a little more tang (I add more dip here too, as well as some Texas Pete) and the fries are just your standard crinkle fries, but both are good. I’m not a huge fan of the pickle slices that come on top of the slaw, but they don’t really affect the flavor of the slaw once removed, so no harm done. 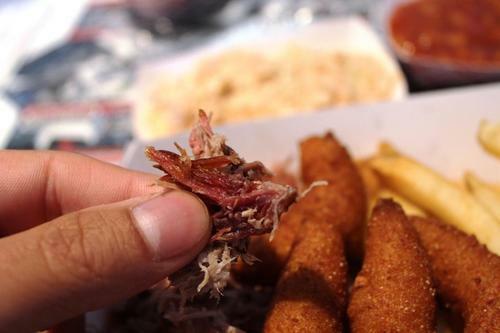 The hush puppies at Kepley’s are perfect – definitely among the best you’ll find anywhere. Monk: Well that’s settled. 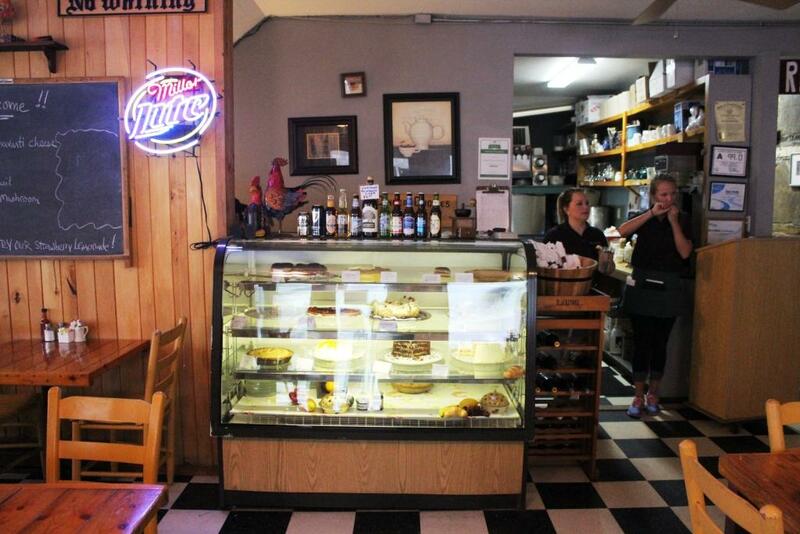 I’m definitely heading to Kepley’s next time I make it home. 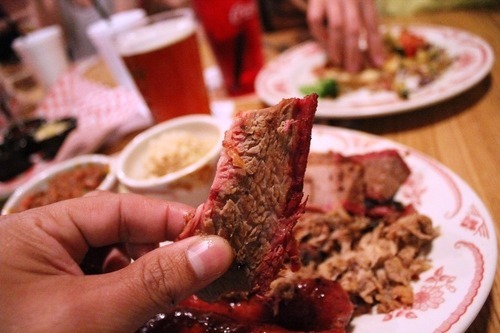 Speedy: All in all, Kepley’s is a very good barbecue restaurant. If you moved it to the middle of Lexington, it would stack up well with the other joints in town. 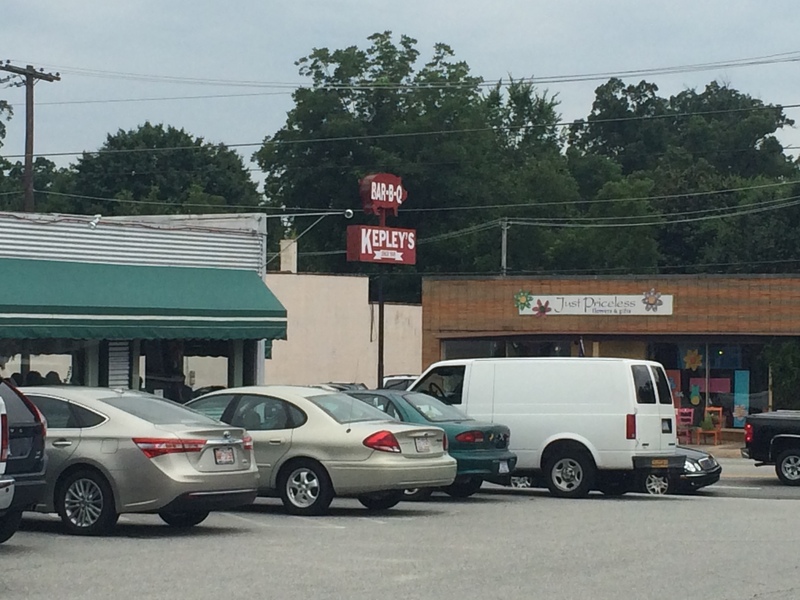 If you find yourself in downtown High Point, I’d say Kepley’s Barbecue is definitely the place to go to check out some ‘cue. In advance of a recent long weekend to visit friends in Atlanta, our original plan was to go to Fox Brothers but after I consulted with Grant of Marie, Let’s Eat! 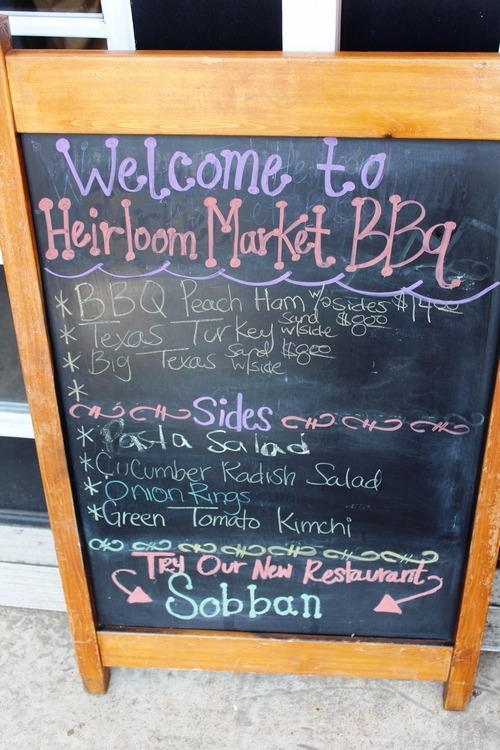 on Twitter (who then wrote a funny letter to Mrs. Monk) we decided that Heirloom Market BBQ would be a better way to go. Not that Fox Brothers wouldn’t have been good (especially since Mrs. Monk and I could have used a beer or three after a 4 hour drive with a sometimes fussy 15 month old), but it probably wouldn’t have been as representative of Atlanta as Heirloom Market seeing as how Fox Brothers is a Texas-style joint. 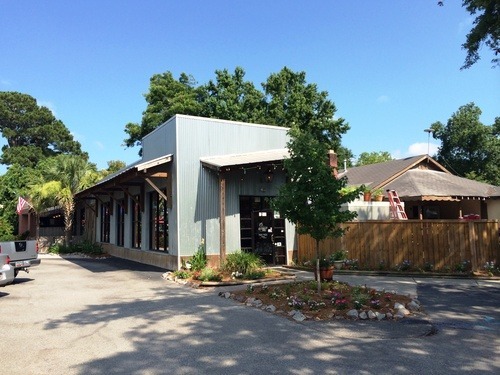 Heirloom Market is located at the opposite end of a convenience store and doesn’t offer much in the way of seating other than an outdoor deck that is standing only. Diners can also take respite in the tent over a long rectangular table or in the shade next to their mobile smoker, as some did on this slightly steamy late-June afternoon. 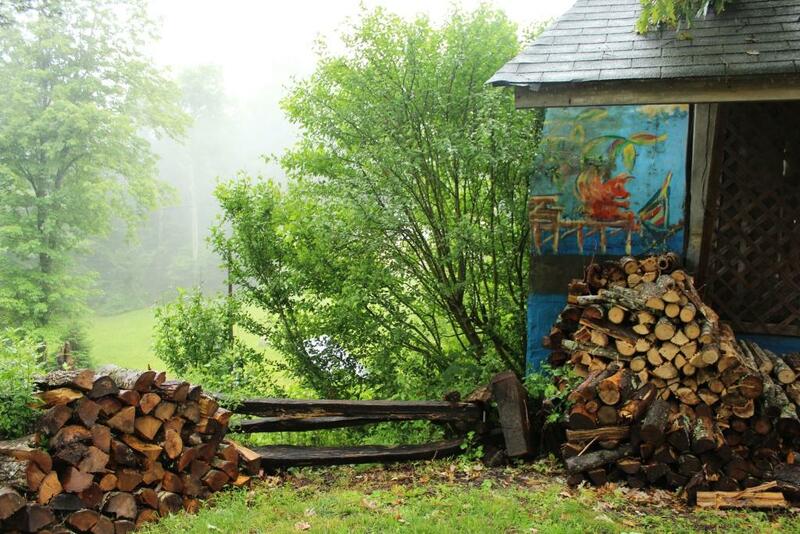 Also out back is the smokehouse, into which I periodically saw a worker carting pallets of split logs for smoking. 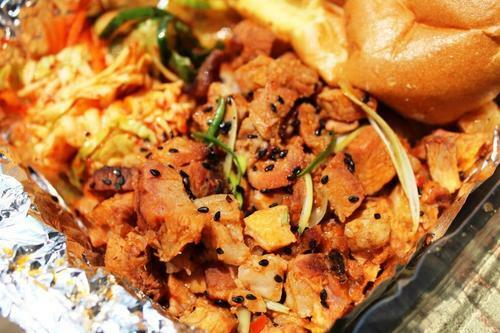 The spicy Korean pork comes in chunks as opposed to pulled or chopped. 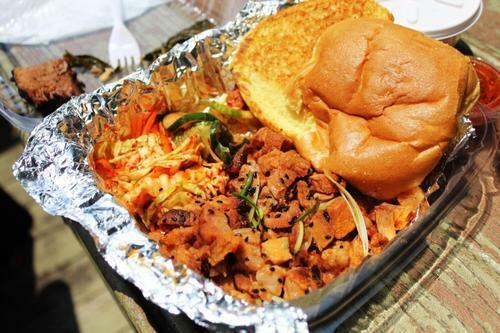 The platters come with a substantial bun so folks can make a sandwich with a portion of the meat and then finish the rest with a fork. 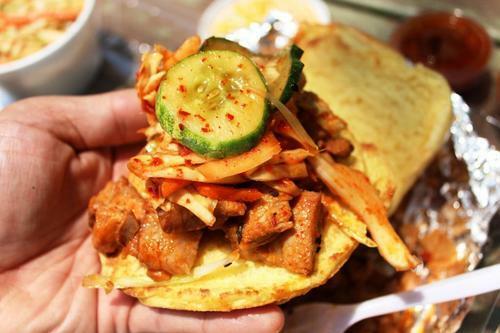 I piled on the kimchi slaw and a little spicy korean sauce called “KB” and the resulting sandwich was a revelation. I hadn’t tasted any barbecue like this before, with the smokiness of the pork from the wood smoke mixing with the spicy korean sauce and the crunchy kimchi slaw. There are no words to express just how fantastic it was. 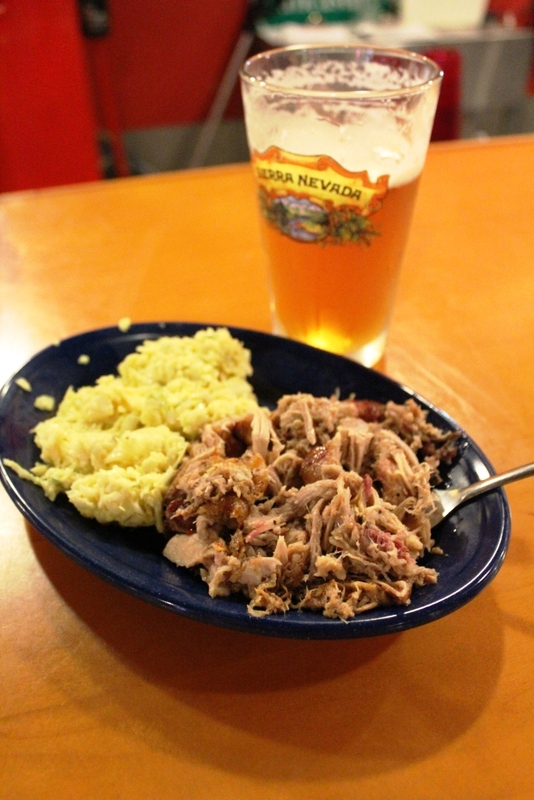 I was also able to taste both the regular pork and the brisket from Mrs. Monk and my buddy Jimbo. Mrs. Monk didn’t come close to finishing her pork platter, so naturally I obliged in helping her do so. I found it to have nice smokiness, good bark, moist texture. The brisket had a Texas-style black bark, but was a tad on the dry side that day. Still, both were fantastic albeit maybe a level below the spicy pork. I already mentioned the kimchi slaw I had with the bread, and my second side was Brunswick stew; I’m not a huge Brunswick stew fan but “when in Georgia,” I figured. Though honestly, hot stew didn’t make a lot of sense on an hot day in June when I was already sweating due to the spicy pork, even if the stew did have chunks of smoky pork and obviously not frozen veggies. Worth getting, but preferably during the cooler months or if you take it back to home or work in AC. I also tried some of the collards, which were also quite good. Even though I left a little bit sweaty due in equal parts to the spicy sauce as well as the fact that we found a spot on the deck where there wasn’t much shade, I left very satisfied. Maybe during our next trip down to Atlanta we will make it to Fox Brothers, but it was clear to me that we made the right choice in choosing Heirloom Market BBQ this time instead. 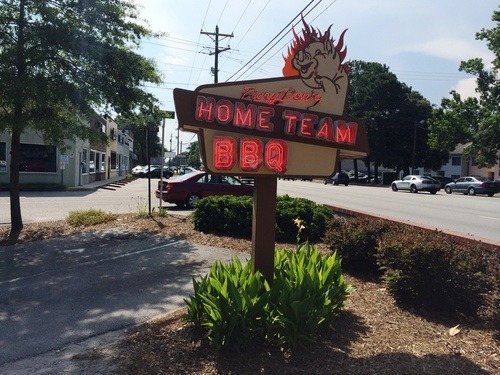 I had heard a lot of great things about Home Team BBQ and owner/chef Aaron Siegel, so knew I had to check it out when I went with the fam to Charleston for a week. A recent Esquire article only confirmed my desire to check it out. A lazy afternoon presented the perfect opportunity to check it out with my Dad and Bro – two guys familiar with good ‘cue. Upon arriving, I really enjoyed the atmosphere. 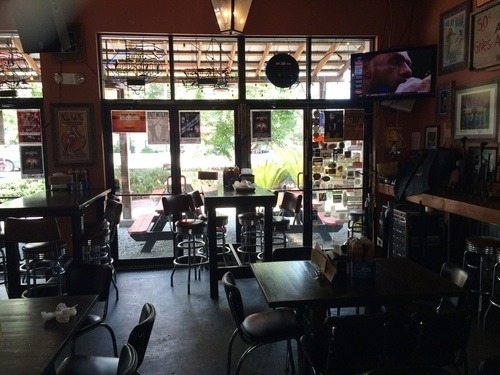 Home Team has both indoor and outdoor seating and also has a nice bar. 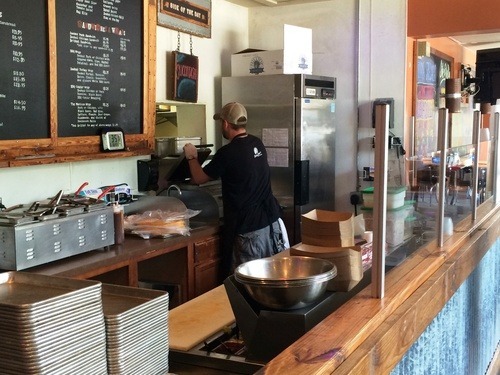 You order at the counter, and both the meat and the sides are sitting in steam trays and ready to be pulled (with the exception of the ribs, which are cut in the back). I found this to be a little bit of an odd presentation, and I’m not sure it helped the quality of the meal. Digging in, I thought the pork lacked flavor – it was definitely moist (thanks to the steam trays), but I couldn’t really taste any seasoning or smoke on the meat. A lot of places like to “let the meat speak for itself” but I think truly great ‘cue needs to have that smoke flavor and a good rub only enhances it. 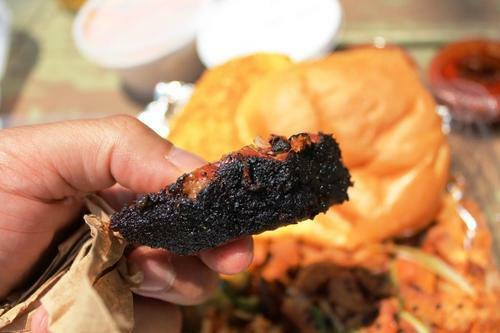 The brisket was similar – moist, but in need of sauce. Home Team has several sauces – I stuck with the hot red – which helps, but overall, I was a little disappointed in the pork and brisket. I had higher expectations for the ribs and while those lofty expectations weren’t quite met, I did enjoy them. I was first surprised that they were spare ribs, as I’d expect America’s best ribs to be baby back ribs, which I generally find to be more tender. The spare ribs were presented dry, and had a fair amount of seasoning, which I enjoyed. 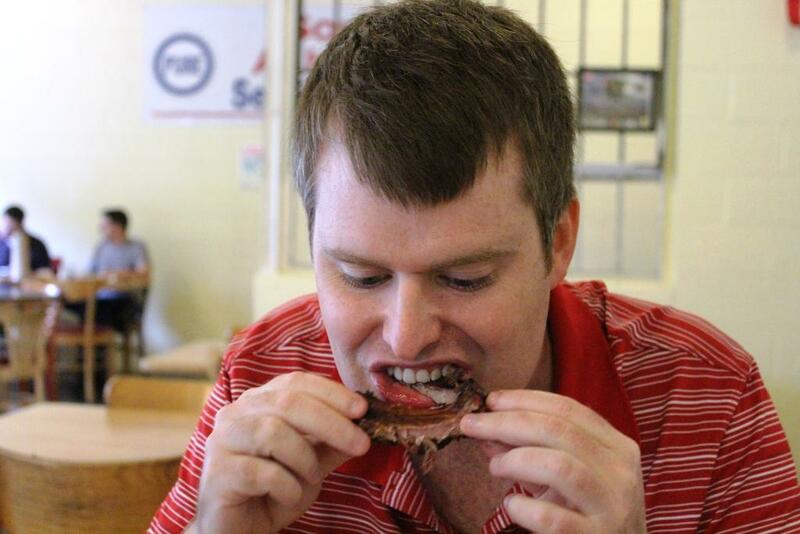 The ribs were fairly tender, and I did enjoy them, but best ribs in America, they are not. The sides, on the other hand, were excellent. The collards were perfect and the red rice was enjoyable. The Bro said that the baked beans (which I didn’t sample) were the best he’d ever had, so that’s high praise. There were no hush puppies on the menu, which is always a disappointment, but each platter did come with corn bread muffins, which were also very good. Overall, the meal at Home Team was a little underwhelming. 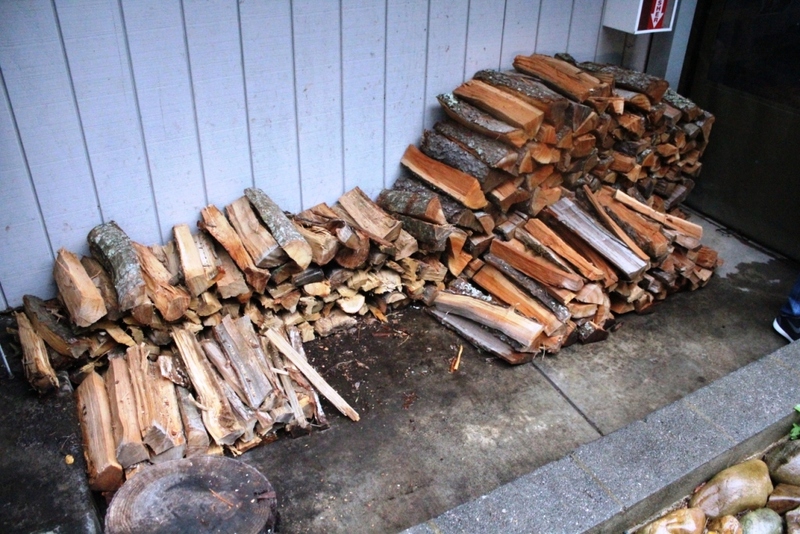 So much so that I decided to walk around the building looking for a wood pile, as I didn’t think the food tasted wood-smoked. 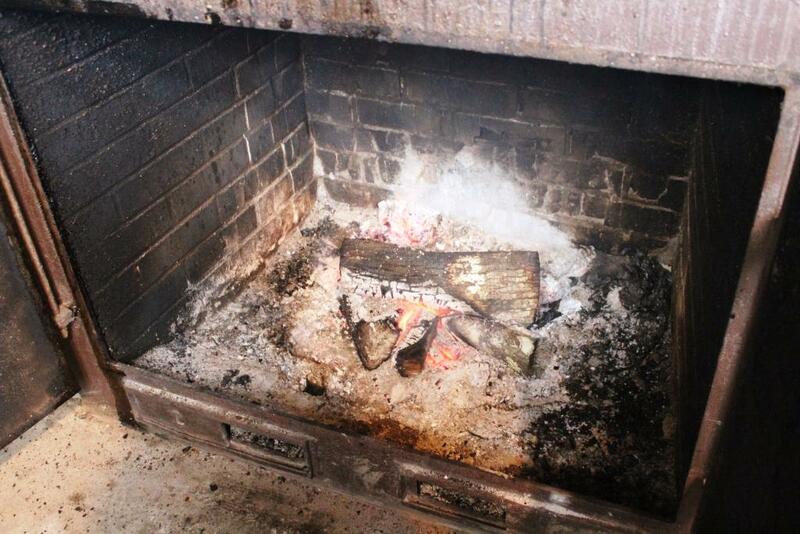 I did find said wood pile, so I think maybe the stream tray hid the smoke flavor. 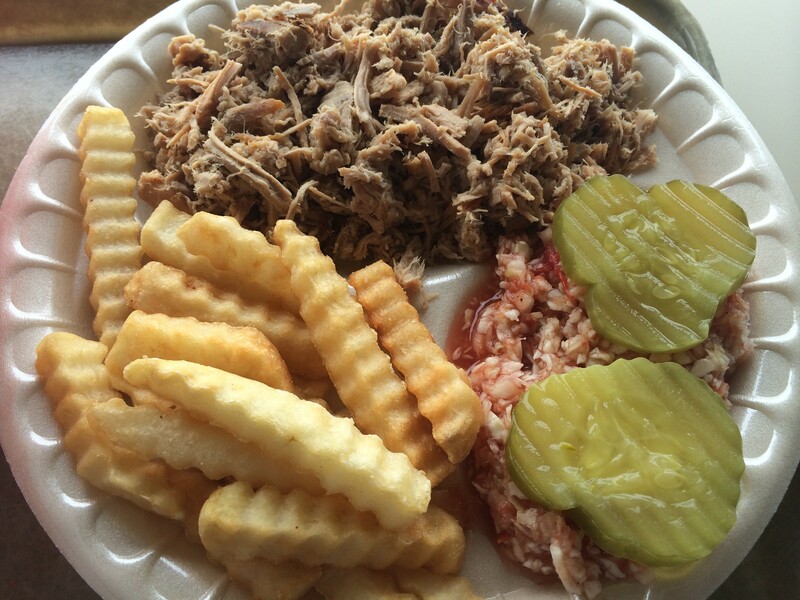 I don’t know much about the Charleston BBQ scene, but I think on my next trip, I’ll check out a new place instead of a return to Home Team BBQ. 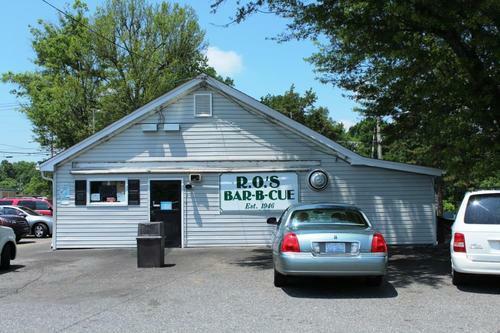 After Kyle Fletcher’s, Mrs. Monk was cool with us checking out R.O.‘s Bar-B-Q while we were in Gastonia. Because frankly, we don’t make the trip from Charlotte to Gastonia all that often (slash ever), so might as well take advantage of it. Well me, not so much her; she stayed in the car. I won’t say it turned out to be a mistake, because at the very least I was able to cross another joint off our list. But it was not even close to being good. 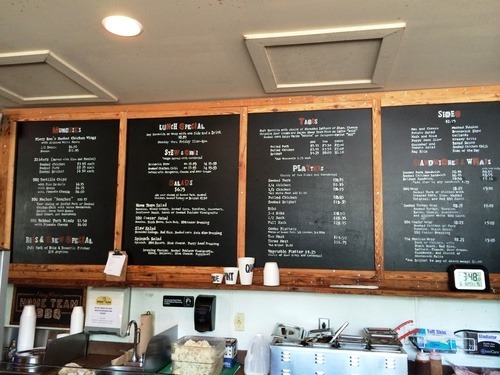 The menu board at the register listed an “oven roasted pork” sandwich, so at least there were no illusions whether or not this was true barbecue. I ordered a barbecue sandwich, hush puppies, and slaw, only to be told that the slaw came on the sandwich. Cool, I thought, since the sides were all a la carte and the hush puppies alone were $2.25 on their own. Little did I know that the “slaw” that comes on the sandwich is a sauce of what appears to be a thousand island and diced cabbage. Had I known, I would have asked for it on the side. It more or less made the sandwich inedible for me. I had maybe 3 bites before wrapping it back up to throw away. 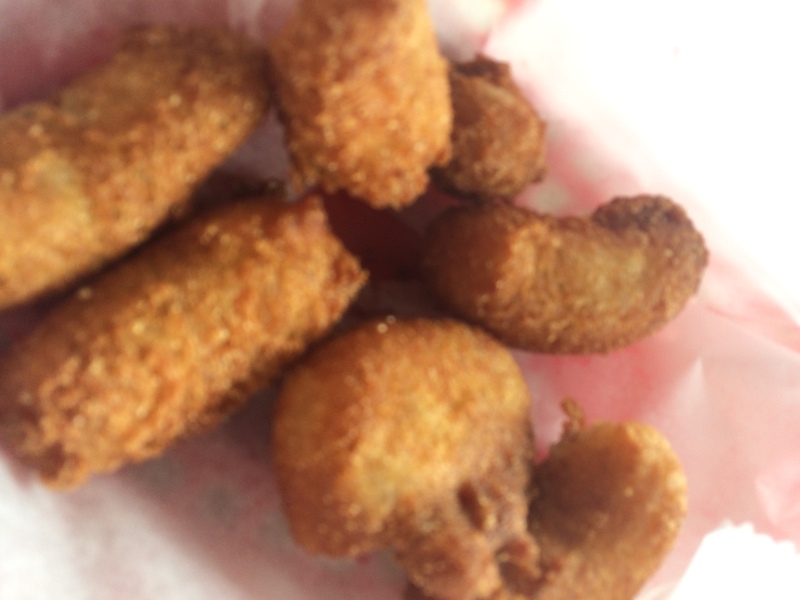 At least the hush puppies were good – in fact, they were better than the ones we had just had at Kyle Fletcher’s. By far, the best part of the meal. There must be something that keeps the folks coming to R.O.’s Bar-B-Q since it originally opened in 1946, but I’m not sure what it is. 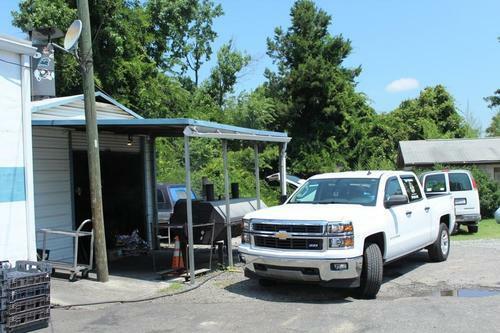 If you are looking for true barbecue in Gastonia, don’t come here. Their version of barbecue is some mutant hybrid that doesn’t fit the definition of traditional barbecue in any way. If you are looking for a good value, you probably shouldn’t come here either. 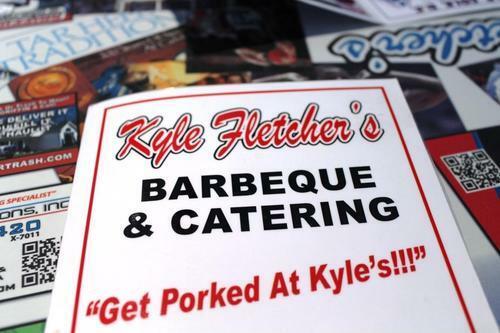 My total was nearly $10, which was more than my meal at Kyle Fletcher’s, and for far less food. 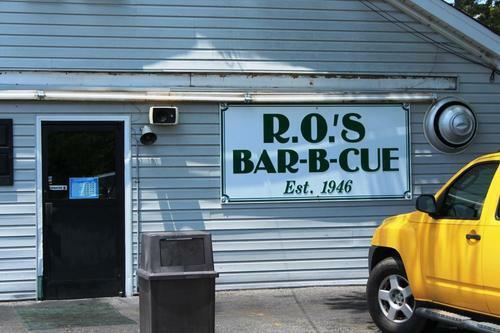 That being said, if you are looking for something you haven’t eaten before and likely won’t see too many other places, feel free to check out R.O.’s Bar-B-Q. First off, I’d like to apologize to Speedy for going to Kyle Fletcher’s without him. 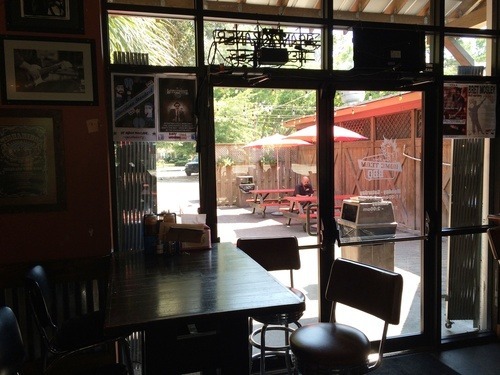 Ever since they beat one of our favorites, Red Bridges Barbecue Lodge, in the championship round of the Charlotte Observer’s Best Barbecue in the Charlotte Area bracket year, we had discussed checking it out together. Unfortunately (for Speedy, not me), for Father’s Day Mrs. Monk decided to surprise me with a quick barbecue tour of Gastonia for lunch. So you see it was out of my hands. The parking lot to Kyle Fletcher’s is a bit of a maze to negotiate, but we were able to find a spot without too much hassle (leaving would be a little trickier). 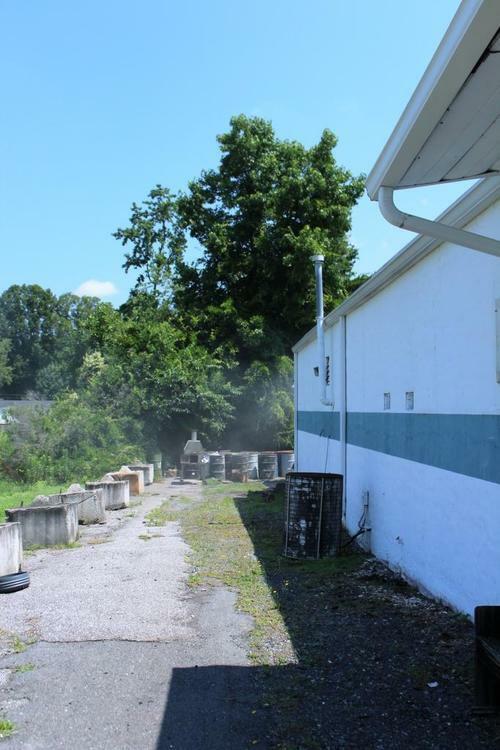 We arrived at 11am on a Saturday, with the smokers are going full blast at the rear of the building, creating a smoky haze in the parking lot. So far so good. Skipping ahead a little bit, you will see below that I gave the atmosphere 1 hog. 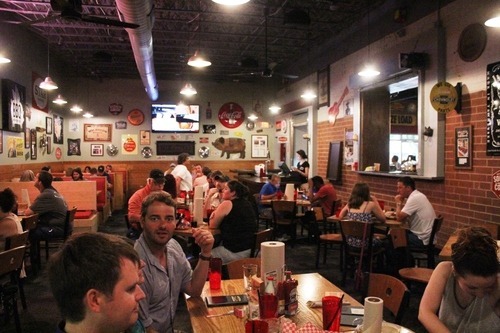 That is because I am an NC State fan, and the walls and tables in Kyle Fletcher’s look like Dean Smith and Charles Kuralt collectively threw up on them (i.e. they are covered with UNC memorabilia). The only reason why I didn’t give it 0 hogs was because they did have one NC State baseball jersey on the wall towards the back. We were able to sit right away but had we arrived 30-45 minutes later we would have been waiting for a table. There were also quite a bit of pick up orders that day. Based on what I saw, the Gastonia locals certainly seem to love this place. Which is why it was a little unfortunate that while the pork was smoky with a good amount of bark mixed in, I found it to be a bit dry. Using the table dip – a reddish vinegar concoction which I understand is neither an eastern nor Lexington style dip – helped but the texture a bit was still a bit dry nonetheless. At this point, I must mention that the portions here were huge. Both Mrs. Monk and I got a small plate while we ordered a kids meal for the Monk-ette. Well, as it turns out, the small plates (served in cardboard trays) were really large and the kids plates are average size. I can only imagine the size of the large plate and the giants who must eat them. It was a great value for the money, that’s for sure. 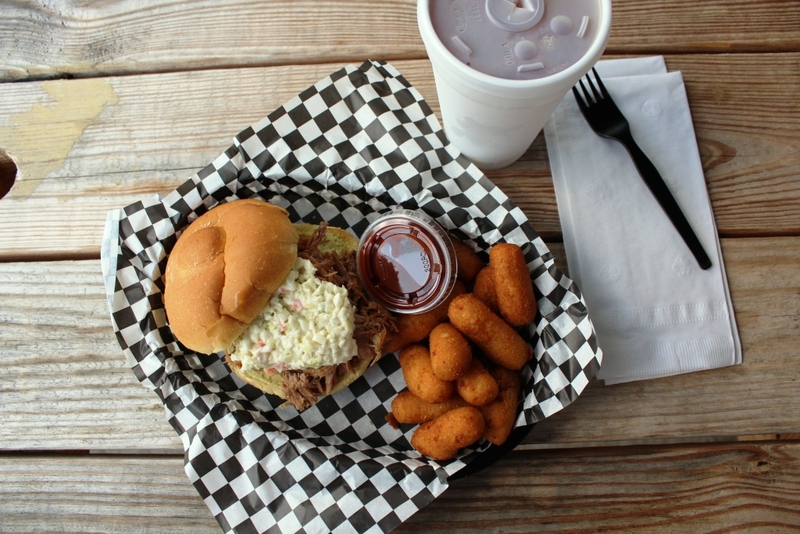 Each plate also comes with hush puppies, slaw, and fries. All were the definition of average, and none particularly stood out except maybe the hush puppies. Still, it was a lot of food for the money. 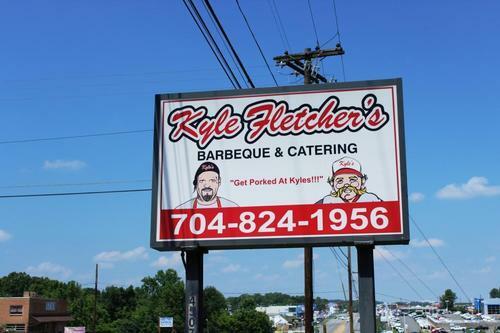 It would be an understatement to say that I expected more from Kyle Fletcher’s. 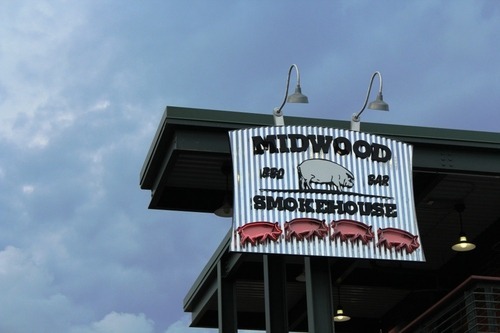 I can’t see how this place was named the winner of the Barbecue Bracket by the Charlotte Observer panel of judges, unless those folks had a vastly different experience than I did. In fact, Speedy, I would gladly check this place out again with you just to see if this visit could have been an anomaly. That is, if you aren’t still holding a grudge. Speedy: Happy two year blogaversary, Monk! Monk: And a happy blogaversary to you too, Speedy! What is the present for a two year blogaversary? Bacon? Speedy: Might be a little early for that. Let’s call it the hushpuppy anniversary. 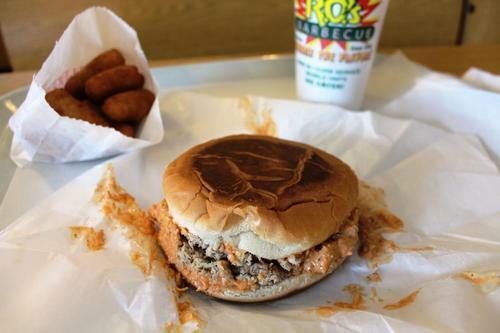 Anyway, Monk and I have a few spots in our Charlotte that are kind of go-to spots for a nice barbecue meal. 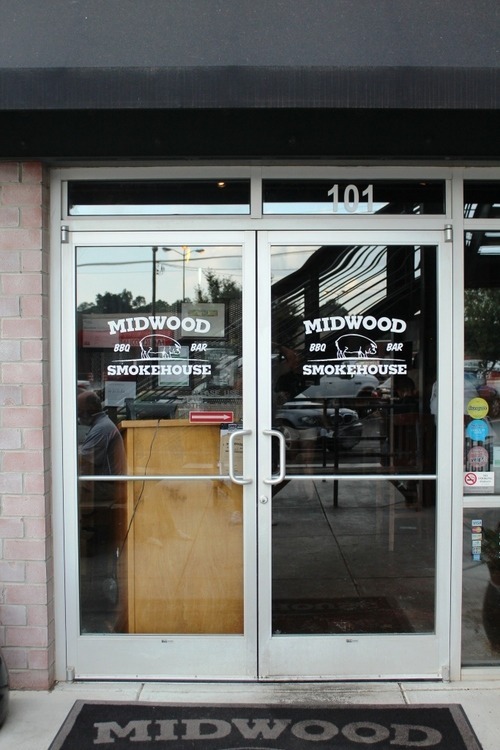 We probably frequent Queen City Q and Midwood Smokehouse the most, but I’d probably consider Midwood Smokehouse my favorite in Charlotte. 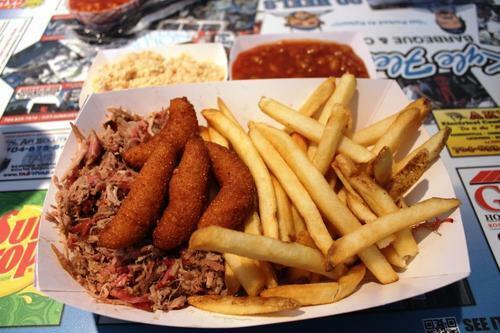 When Monk recently moved a food truck ahead of the Smokehouse on the Charlotte Big Board, I thought it was time for a re-review. 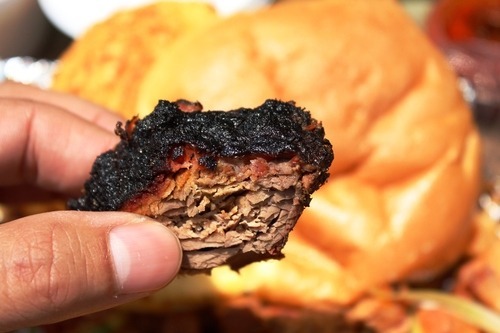 The reasons for the re-review are two-fold: 1) our initial review was completed shortly after starting the blog (I mean, we ordered smoked turkey for chrissake), and I think Midwood itself has improved, including adding their awesome burnt ends to the menu full time (or so we thought). Monk: To clarify, they do have burnt ends on the menu full time but they don’t allow you to choose that as one of the meats in the combo platter we were ordering. Which didn’t matter anyways, because they happened to be out of them that night. 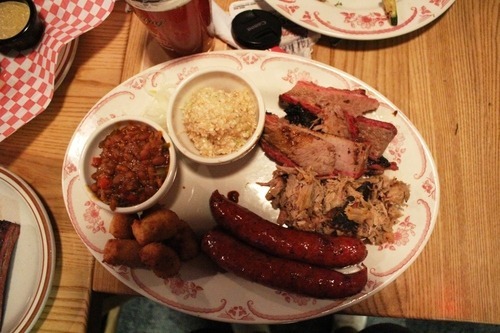 Undeterred (well, mostly me, not so much Speedy), we chose our four meats for the Pig Out Combo Platter – chopped pork, brisket, sausage and St. Louis ribs. No smoked turkey this time! 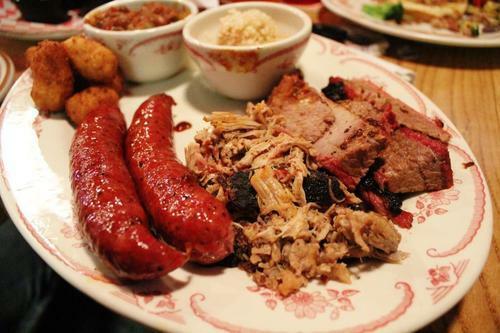 Speedy: I’m not sure if my take on this meal was colored by the lack of burnt ends, but the overall experience was not as good as I was expecting. The pork is very good, but I remember it having a considerably smokier flavor. Don’t get me wrong – you could still taste the smoke, but it used to be the smokiest pork I’d ever tasted, which I actually liked. The brisket was actually better than I remember. Monk and I ordered a mix between fatty and lean, which was a mistake. The fatty brisket was awesome, and included a really nice bark, but the lean was pretty dry. It’s still among the best brisket that I’ve found in NC, but shying away from the lean is the right play. 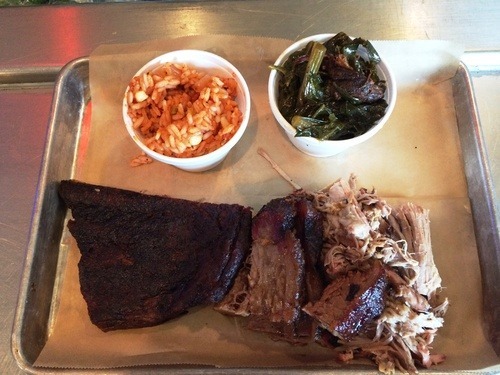 Monk: Fatty is definitely the way to go, and I agree that the brisket has improved considerably in the two years since our last official review. I may go as far as to say it just may be the best brisket in Charlotte. Although after eating a few slices I noted to Speedy that it seemed a little dry only to realize that was because he had taken all of the fatty slices! Et tu, Speedy? The sausage had a nice snap and great flavor, but I assume that it’s not made in house. I haven’t heard or read otherwise so can’t be sure, but in any case it’s still a very solid sausage for North Carolina. Ribs are less so my jam than Speedy, but they had a good amount of tenderness and provided the right amount of tug, not falling off the bone with each bite. 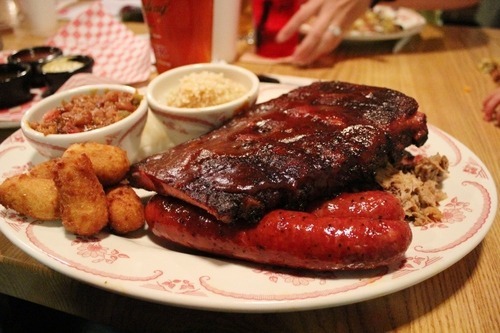 Monk: We experienced this last fall at one of our favorite joints ever, Red Bridges Barbecue Lodge in Shelby. We went in fully expecting a slam-dunk 5 hog review but that particular experience didn’t measure up, so we just couldn’t do it. 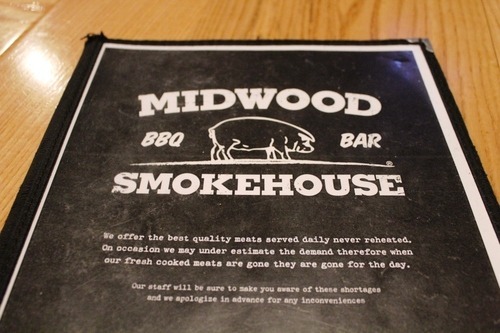 Still, Midwood Smokehouse is our favorite brick and mortar barbecue joint in town, and I think I can speak for Speedy that we would highly recommend it to anyone looking for good and occasionally great barbecue in Charlotte.